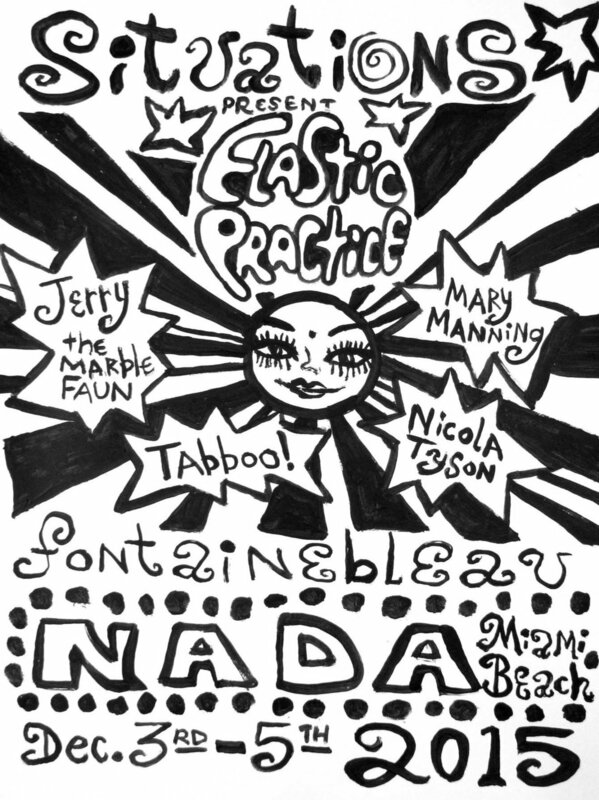 SITUATIONS presents—ELASTIC PRACTICE—a presentation of four intergenerational queer artists: Jerry the Marble Faun (Jerry Torre), Mary Manning, Tabboo! (Stephen Tashjian), and Nicola Tyson, whose fluid practices expand through varied disciplines, media, and modes of distribution. Whether working individually or collaboratively, they freely engage poetry, dance, performance, theater, cabaret, design, film, and popular culture within their work. Shared interests and themes relate to identity: the self-taught, the self-identified, the quantified self, and the multiplicity of selves within a community. This presentation at NADA Miami is conceived as a collage that will reveal unexpected relationships among the artists and works: Manning’s photographic collages that emanate from her rich and poetic observations of daily life; Tyson’s psycho-figurative paintings of portraits and flowers; Tabboo!’s exuberant works on paper made with his distinctive graphic line, lettering, and use of paint and glitter; and Jerry the Marble Faun’s sensitive and playful ceramic sculptures of horses. Jackie Klempay Gallery presentation at the Outsider Art Fair in New York, Jerry received widespread recognition and critical praise from major outlets, including The New York Times, The Wall Street Journal, The New York Observer, Forbes, Vogue, Interview, and Architectural Digest. Manning’s practice is her celebrated website Unchanging Window. Since 2006, she has posted images and documentation of her life alongside relevant music, film, and literary source material. Manning has exhibited her work at Jackie Klempay Gallery and Andrew Edlin Gallery in New York and at Space 15 Twenty in Los Angeles. She was a panelist for Finding Photography at the New Museum in New York, and in 2014, a book of Manning’s photographs, First Impressions of Greece, was published by Peradam Press. Nicola Tyson is an artist and writer whose interdisciplinary practice includes painting, drawing, printmaking, photography, and sculpture. She was born in London, attended Chelsea School of Art, and lives and works in New York. Tyson describes her work as “psycho-figuration,” and uses distorted proportions and saturated color to suggest her interest in the figure, subjectivity, and issues of identity, gender, and sexuality. In the early ’90s, Tyson founded Trial Balloon, an alternative project space in New York dedicated to exhibiting the work of women artists. In 2013, she published Dead Letter Men, a collection of letters written by her to historical male artists such as Francis Bacon, Édouard Manet, and Pablo Picasso. Her project A Drawing a Day (2015) features a daily posting of one of her drawings on multiple social media platforms. Tyson’s work has been exhibited internationally at Whitechapel Gallery in London, the San Francisco Museum of Modern Art, Petzel Gallery in New York, Sadie Coles HQ in London, and Susanne Vielmetter Los Angeles Projects, among others. Her work is in permanent collections at the Tate Gallery in London, the Walker Art Center in Minneapolis, the Museum of Modern Art in New York, the Solomon R. Guggenheim Museum in New York, and the San Francisco Museum of Modern Art. Tabboo! is a legendary underground visual artist, drag performer, actor, puppeteer, muse, and singer. After studying in Boston, he moved to New York in 1982. He quickly established himself as a celebrated artist, performing regularly at the Pyramid Club and in the East Village underground scene. He worked collaboratively and in close dialogue with his peers, including Jack Pierson, Mark Morrisroe, Nan Goldin, and David Armstrong. Tabboo! 's paintings, collages, and photographs spill over with a riotous mixture of punk energy and high camp; in a 1995 interview with Linda Simpson about his early work, he observed: "The subject matter was drag, glamour, ladies' shoes, lingerie, hairdos, vinyl—same as now." Tabboo! has performed extensively, created murals for public projects, and designed flyers, album covers, and advertising for major publications and underground venues. His artwork and design for Deee-Lite’s World Clique album is an iconic image for the band and related music scene of the early 1990s. His work has been exhibited extensively internationally including at Matthew Marks Gallery, Paul Kasmin Gallery, the New Museum, New York University’s Grey Art Gallery, and White Cube in London. A monograph on his work, Tabboo! The Art of Stephen Tashjian, was published by Damiani in 2013.